2016 may have been the deadliest year on the roads since 2007, with an estimated cost to society of $432 billion, according to preliminary data released by the National Safety Council (NSC). Technology is both improving and complicating matters, making vehicles safer but at the same time amplifying possible driver distractions, as discussed in this New York Times article. Extend laws banning all cell phone use – including hands-free – to all drivers, not just teens; upgrade enforcement from secondary to primary in states with existing bans. I.I.I. tips on how to keep your auto insurance affordable here. Is Apple liable over a fatal car crash involving FaceTime? That’s the question being asked in a lawsuit filed against Apple by the family of a five-year-old girl killed in a Texas car crash. Moriah Modisette was killed and her father seriously injured when driver Garrett Willhelm plowed into their car at 65 mph on a Texas highway on Christmas Eve 2014. As reported by Fortune, Willhelm was chatting on FaceTime at the time of the crash, and the app was still running as rescue workers tried to extricate the injured passengers from the mangled car. In the lawsuit, the family claims that Apple had failed to install a “lock-out” feature on FaceTime that would prevent drivers from using the app while on the road. The lawsuit underscores why liability insurance and product liability insurance are important for businesses. After years of decline in road fatalities, numbers were up 8 percent in 2015. Many believe the rise is due at least in part to distracted driving. In 2014, 3,179 people were killed in distraction-affected crashes, and 431,000 people injured, according to National Highway Traffic Safety Administration data. But apps are not all bad. Several app developers are working to create ways to help make your cellphone a tool in the fight against distracted driving, rather than a cause of it. Check out DMV.org for distracted driving apps that incentivize safe driving by keeping your attention off your phone and on the road. USA Today reviewed other apps aimed at preventing distracted driving here. A fatal car accident involving a Tesla Model S in autonomous driving mode is drawing widespread scrutiny both in the United States and overseas. Joshua Brown was killed in May this year when a tractor trailer made a left turn in front of his Tesla and the self-driving car failed to apply the brakes. The National Highway Traffic Safety Administration (NHTSA) said it is investigating the incident and will examine the design and performance of the automated driving systems in use at the time of the crash. Its preliminary evaluation of the incident doesn’t indicate any conclusion about whether the Tesla vehicle was defective, the NHTSA said. As companies continue to innovate and invest in self-driving technology, the crash indicates that fully automated cars are still a thing of the future. The crash also raises important concerns over regulation. The crash also highlights liability concerns regarding this emerging technology. Most car crashes are caused by human error, but presumably the NHTSA investigation will also evaluate potential product liability on the part of the manufacturer. The crux of the issue is weighing up the risk of crashes versus crashes avoided via the use of self-driving technology. Liability laws might evolve to ensure autonomous vehicle technology advances are not brought to a halt, the I.I.I. adds. After years of decline in road fatalities, numbers were up 8 percent in 2015. Many believe the rise is due at least in part to distracted driving and advocates are looking to programs that have successfully curtailed drunk driving for potential solutions. The New York Times reports that one idea from New York lawmakers, would give police officers a new digital device that is the equivalent of the Breathalyzer — a roadside test called the Textalyzer. An officer arriving at the scene of a crash could ask for the phones of any drivers involved and use the Textalyzer to tap into the operating system to check for recent activity, according to the New York Times article. However, the proposed legislation faces hurdles to becoming law, including privacy concerns, even though the Textalyzer bill would not give the police access to contents of any emails or texts. If the law were to pass in New York, some believe it could spread across other states in the same way that the hands-free rules did after New York adopted them. This is an interesting idea. The insurance industry has long been a major supporter of anti-drunk driving and seatbelt usage campaigns. Distraction was a factor in 10 percent of fatal crashes reported in 2013, according to National Highway Traffic Safety Administration (NHTSA) data. Some 14 percent of distraction-affected crashes occurred while a cell phone was in use, the NHTSA notes. A Highway Loss Data Institute study of collision claims patterns in four states (California, Louisiana, Minnesota and Washington) also found that texting bans may not reduce crash rates. Collisions went up slightly in all the states, except Washington, where the change was statistically insignificant. The use of technology to better assess risk is something that insurers embrace in many different lines of business, including auto and health. Clearly, privacy concerns will need to be weighed, but this is a novel approach to tackling the distracted driving problem. Check out Insurance Information Institute statistics on distracted driving here. I think Jim’s post draws the wrong inference from the data. 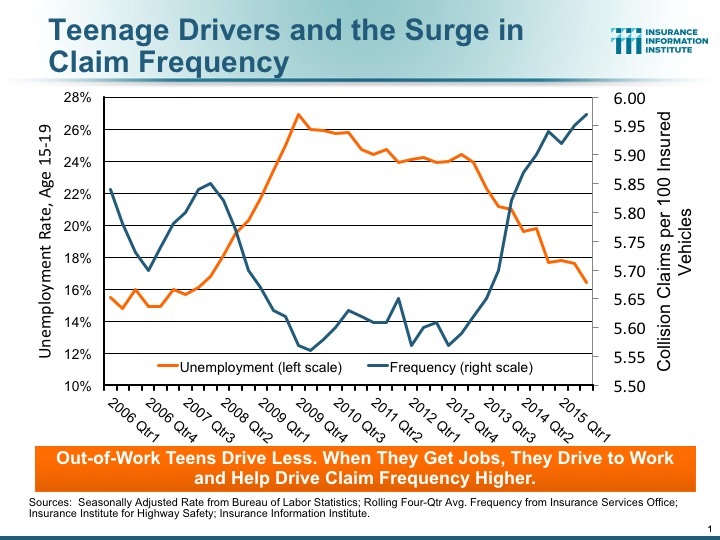 Specifically, the slide pairs the drop in the teenage unemployment rate with the rise in overall collision claim frequency. He infers that if teens are not unemployed, they’re employed and, presumably, driving to work. But the drop in the unemployment rate of this age group isn’t solely—or even mainly—because they’ve taken jobs. To start with, in 2006-07, there were seven million people ages 16 to 19 in the labor force. That began falling in 2008, crossing six million in 2010 and plateauing at about 5.6 million midway through 2011. So in the space of less than five years, about 1.5 million people ages 16-19 disappeared from the labor force. In contrast, the number unemployed in this age range dropped from about 1.1 million in 2006-07 to about 0.9 million in 2015. So about 200,000 got jobs. Some who had been in the labor force in 2006-07 must have gone to school, joined the military, were imprisoned, or simply gave up looking for a job (and therefore were not considered to be in the labor force). If, instead, you look at the number in this age group who were employed in this period, it was 6 million in 2006-07, dropped to 4.3 million in mid-2010, rose to 4.5 million by mid-2014, and was 4.75 million in 2015:Q4. So the number of people in this age group who were employed is still 1.25 million below what it was before the Great Recession and subsequently. I’ve put together a different slide (below), showing the change in employment and the change in claim frequency. As the number of employed falls with the Great Recession, so does claim frequency. And as employment numbers climb, so does claim frequency. 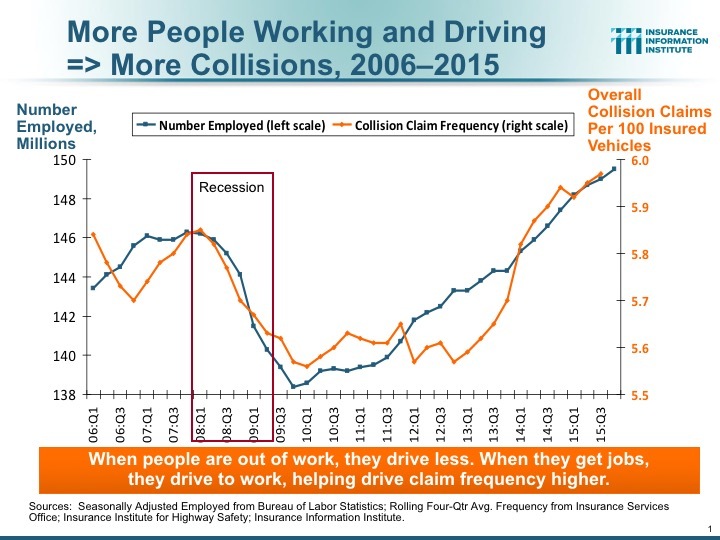 So I’d say that Jim has a good explanation for the spike in the number of claims; more people get jobs, start driving to and from work and unfortunately get into accidents more often. But it wasn’t just teen workers. It was everybody. This chart shows how closely the teen unemployment rate tracks overall auto accident rates countrywide. It’s eerie. When the teen unemployment rate rises in 2008, the rate of accidents plummets. And in 2013, when teen unemployment falls, claim frequency takes off. Here accident rates are measured as collision frequency — the number of collision claims per 100 vehicles over the previous 12 months, as measured by ISO. The seasonally adjusted unemployment rate is from the Bureau of Labor Statistics. The correlation is so strong (R2 = 0.629, for you data geeks) that I’m tempted to hedge. The data seem to say that teen drivers are behind the current spike in auto rates. I think they are part of the reason, maybe even a big part. Certainly teen drivers with jobs have to get to work, so they log more miles, and that will lead to more accidents in any group, but particularly teens, whose driving records are notoriously bad. But many people in this age group can’t drive legally. It would take more research to see how much of the spike in claim frequency is driven by younger drivers. I was inspired to put this together by an article in the Insurance Institute of Highway Safety’s (IIHS) Status Report, which showed how more teens are on the road. Their point was to dispel the idea that teens had given up driving for good, that young people would rather text their friends than see them face to face. Instead, IIHS showed, teens were driving less because they didn’t have jobs. Once they got jobs, they started driving again. At the Insurance Information Institute, we speak frequently about how driving trends affect insurance. We post our PowerPoint slide decks here. We also collect many facts and statistics on auto insurance here. Everyone wants to talk about autonomous vehicles, and for proof I.I.I. chief actuary Jim Lynch offers the AIPSO Residual Market Forum, at which he spoke in mid-April. AIPSO manages most of the automobile residual market, where highest risk drivers get insurance. Each state has a separate plan for handling risky drivers and AIPSO services most of them in one way or another, acting as the linchpin in the $1.4 billion market, about 0.7% of all U.S. auto insurance written in 2013, according to Auto Insurance Report. Though small, the residual market is important, but it’s not an area that would naturally lend itself to discussing the self-driving car. If cars could drive themselves, of course, there wouldn’t be much of a residual market. Even so, I was one of three speakers at the forum’s panel exploring industry trends, and at AIPSO’s request, all three of us touched on autonomous cars. Though he spoke last, Peter Drogan, chief actuary at AMICA Mutual Insurance, probably did the best job of laying out the future technology and some of its challenges. Particularly spooky was a 60 Minutes clip in which a hacker took over a car Lesley Stahl drove over a parking lot test course. She wasn’t driving fast, but she couldn’t stop after the hacker took over the brakes of her car. Karen Furtado, a partner at Strategy Meets Action, a consultancy that helps insurers plan for the future, laid out the case for disruption. Autonomous vehicles will not only make vehicles safer, they will change driving habits. Fewer cars will be on the road, and more people will share them, summoning self-driving vehicles through ride-sharing apps, all of which could potentially shrink the $180 billion auto insurance market. I’ve made my thoughts clear before, both in this blog and elsewhere: the technology will change driving forever, but it takes about three decades for auto technology to become common on roadways, giving insurers a lot of time to adjust. And some coverages, like comprehensive, will not be affected, as they protect cars when they aren’t in accidents. A PowerPoint of my presentation is posted here.